A new website called Unimak Area has been erected. Lots of info on the Eastern Aleutian region. Enjoy. Suzawa Ikunori of Japan has shared some pictures of paddles from the Kuril Island of Simushir. As I mentioned in a previous post, the Aleuts who made these paddles were probably brought to Simushir by Russians during the Russian colonial period. What is unique about these paddles is that the blades have ridges on both faces although the ridge on one face is more distinct than the ridge on the other. The ridge that is less distinct is on the face of the blade that is normally flat. Although it isn't obvious from the photo, Suzawa has pointed out that there is a slight tilt to the axis of the blade in the direction of the more pronounced rib. That is, the paddle is a bit of a bent shaft paddle. Whether this bend is intentional or a result of use or an accident of storage is not known. If you click on the photo to enlarge it, you can see the upward trend of the edge of the blade of the paddle viewed edge on. In any case, this paddle does nothing to clear up the mystery of how the Aleuts held their paddles. But I should point out that the loom was egg shaped as in other Aleut paddles. Ninety miles north of San Francisco on the Pacific coast stands Fort Ross, southernmost outpost of the Russian empire in North America. 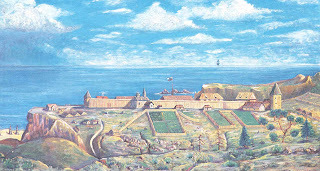 The fort was an attempt to raise crops and animals to supply the Alaskan posts with food and leather. The Russians brought Aleut kayakers and their kayaks with them. The kayaks were used for mail runs to Bodega Bay and San Francisco and also for some occasional hunting and foraging. Some of the Russian presence but none of the kayak paraphernalia has survived. On the other side of the Pacific, between Kamchatka to the north and Hokkaido to the south lie the Kuril Islands. 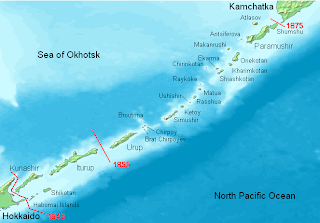 The Islands were mostly under Russian control prior to 1855. Just as the Russians brought Aleuts and their kayaks with them to North America, they brought Aleut kayakers with them to the Kuril Islands. As in America, the Aleuts in the Kuril Islands were no doubt pressed into fur hunting and general gofer work. 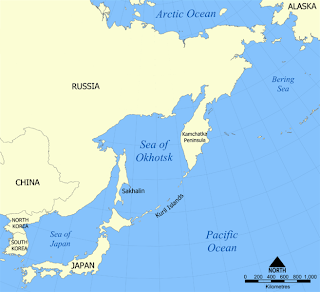 In 1875, a treaty between Japan and Russia moved the boundary between the two countries north to Kamchatka. In 1945, the boundary moved down to Hokkkaido. 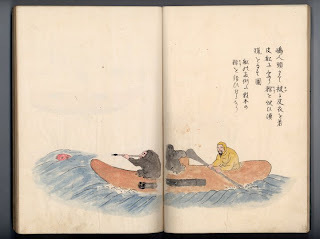 Unlike in America where nothing of the kayaks remained, in the Kuril Islands, the Japanese managed to collect some of the Aleut kayaks and their paraphernalia. These objects are now preserved in Japanese museums. 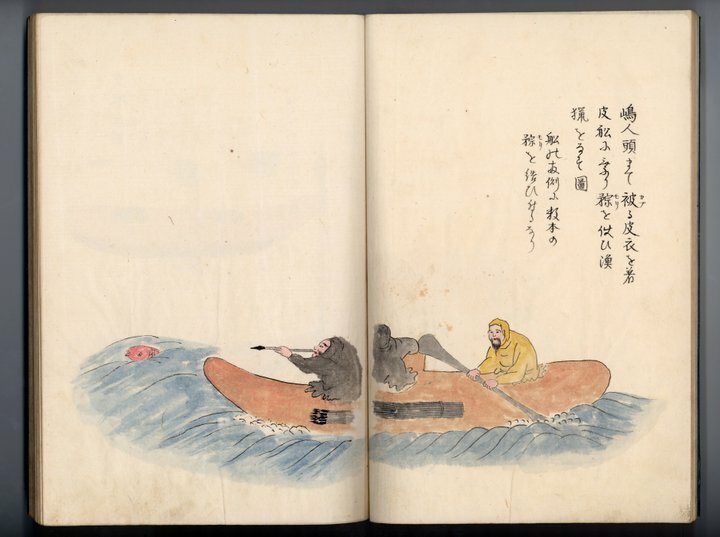 And in closing, a picture of a three hole kayak by a Japanese Artist. Somewhere around 1824, Father Ivan Veniaminov wrote that the kayaks of the Eastern Aleuts were vastly superior to those of their neighbors. I am paraphrasing. This is not a direct quote. 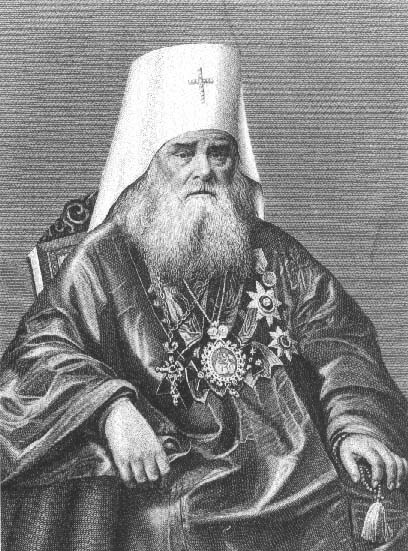 Veniaminov wrote in Russian which I neither read nor write. But I digress. The reason I bring up Veniaminov is his assertion that one kayak is better than another without giving his criteria for making that judgment. And the problem persists. Or perhaps it has even gotten worse. Actually, I'm sure it's gotten worse. The problem as I see it is that in the old days when a kayak was a hunting craft, its excellence could easily be judged. The best kayak was the one that got the most seals given local conditions. Almost two centuries have passed since Veniaminov's pronouncement on the excellence of the Eastern Aleut kayak. The kayak is predominantly a recreational craft and determining which is the best is next to impossible because there are no agreed upon standards for judging recreational value. Which kayak is the best? Is it the shiniest, the cheapest, the fastest, the most stable, the ruggedest, the lightest, the best rollingest, the most comfortable, the roomiest? Who knows? Any kayak is better than no kayak. If it gets you out on the water then it's good.